Tony Blair has arrived in Moscow for the first of a series of talks with world leaders to discuss Africa and climate change ahead of the G8 summit. On Saturday, the world's richest countries agreed to write off the debt owed by 18 mainly African countries. The prime minister will also use visits to Berlin and Paris to press for a commitment to further aid. He returned from talks in the US last week after securing a pledge from President George W Bush on debt relief. The pair will seek backing for their plan at the G8 group's summit in Gleneagles, Scotland. But they failed to agree on taking action against climate change. As Mr Blair boarded his plane for Moscow on Sunday, his spokesman said Russia was a signatory to the Kyoto treaty on climate change and it was expected to be supportive of Britain's agenda for Africa. "We believe they have an important role in terms of urging others to sign up to what we are trying to achieve in Africa," the spokesman said. Other topics under discussion with Russian President Vladimir Putin would be bilateral issues such as EU-Russia economic links, as Britain takes over the EU presidency in July, and human rights. "We have not hidden the fact that we have had certain concerns, but we do believe President Putin's state of the union speech recently and his response to a recent human rights report showed signs of progress on that front," the spokesman said. "We will not stop airing our concerns but we will acknowledge progress where it has been made." Under the package agreed by G8 finance ministers meeting in London on Saturday, the world's richest countries said they would write off the $40bn (£22bn; 33bn euros) debt owed to them. The World Bank, the International Monetary Fund and the African Development Fund will immediately write off 100% of the money owed them by nations including Benin, Bolivia, Ethiopia and Ghana. Anti-poverty campaigners welcomed the deal but say they want more nations to benefit. 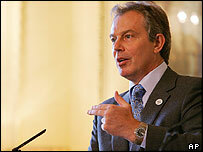 Mr Blair will travel to Berlin after Moscow for talks with German Chancellor Gerhard Schroeder. Recent "no" votes for the EU constitution in France and the Netherlands would "have an impact on talks" in Germany, Mr Blair's spokesman said. Mr Blair will also hold talks in Luxembourg whose presidency of the EU the UK will take over in July. He will then visit French President Jacques Chirac in Paris, as well as attending a seminar with him and United Nations secretary general Kofi Annan.